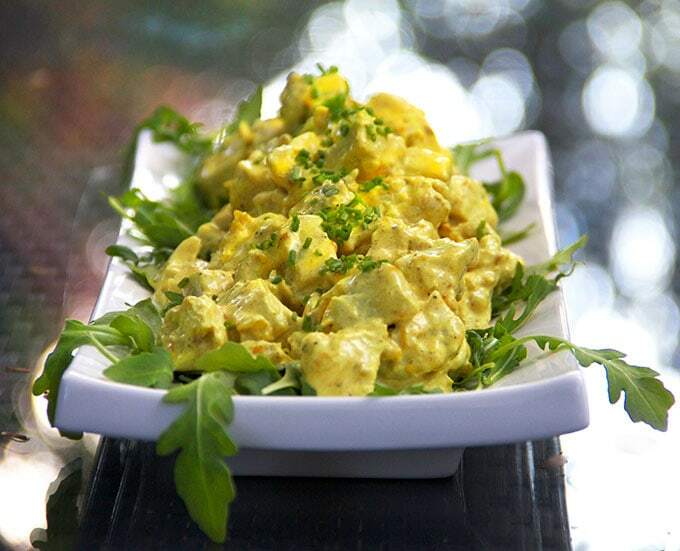 Everyone needs a great recipe for curried chicken salad in their repertoire. This one is my favorite! This curried chicken salad is tender and creamy. The exciting flavors come from the combination of warm curry spices mixed with tangy lime juice and sweet fruity chutney. Scoop it onto a salad for lunch or make a sandwich and pack it up for a picnic. Any way you serve it, you are in for a treat! Who invented curried chicken salad? Where in the world did the recipe come from? In all my years of making curried chicken salad, I never asked these questions – until now. Since starting Panning The Globe I’ve learned that there is usually way more to a recipe than just the ingredients and cooking technique. There’s often a rich history or, at the very least, an interesting story that explains how a particular dish came to be. 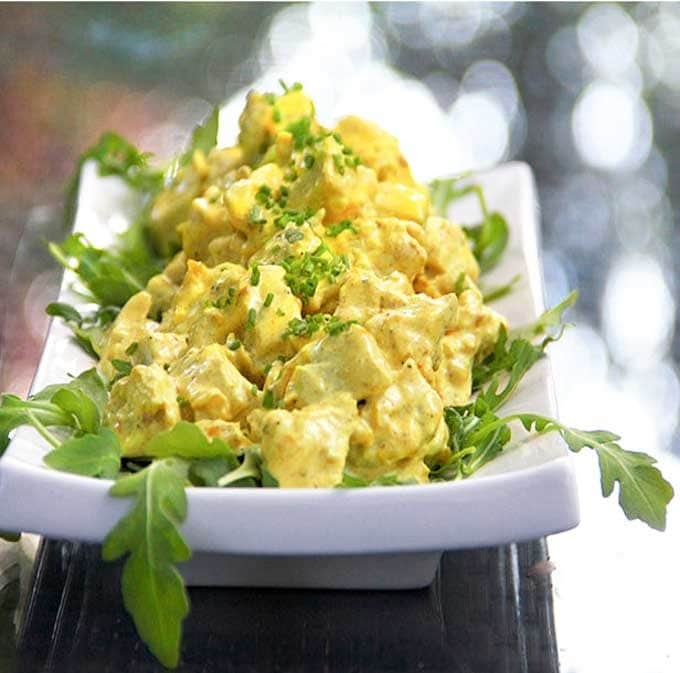 Curried Chicken Salad was invented to feed the 350 foreign dignitaries attending Queen Elizabeth II’s coronation luncheon on June 2,1953. Here’s the original Coronation Chicken Recipe. Chicken salad is the perfect make-ahead dish for entertaining, which is one of the reasons it was chosen for the Queen’s luncheon. As for the India connection, when the British were colonial rulers over India in the mid-1800’s delicious Indian curry recipes made their way back to Britain with returning colonialists. But surprisingly, curry powder was not invented in India. It’s a British invention. Apparently British colonial cooks weren’t too keen on going through the painstaking process of making the complex spice mixes. The curries used in Indian dishes were labor intensive, with upward of twenty different spices, specially selected and freshly toasted and ground, for a single recipe. Another obstacle was that the fresh spices were expensive and hard to find in Britain. The solution was curry powder. A British company called C&B manufactured the world’s first curry powder and cooking recipes with curry became a lot easier. 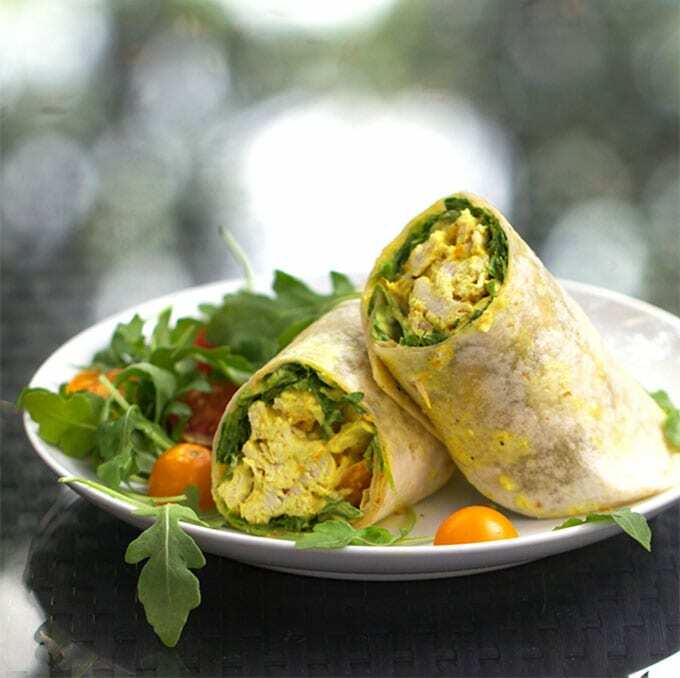 Which Curry Powder Is Best for Curried Chicken Salad? 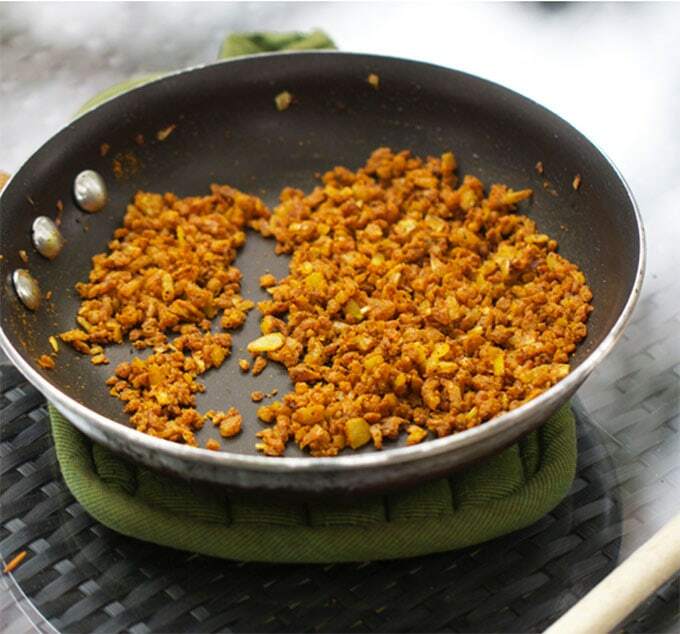 Curry powder is a mixture of spices and and can vary wildly. Many experienced cooks would agree that homemade curry powder, made with freshly toasted and ground spices, is superior to the stuff you buy in a jar. Yet I’ve chosen to use store-bought curry powder for this chicken salad, as was done for the curried chicken salad at Queen Elizabeth’s luncheon. It’s amazingly delicious this way – plus it’s quick and easy. 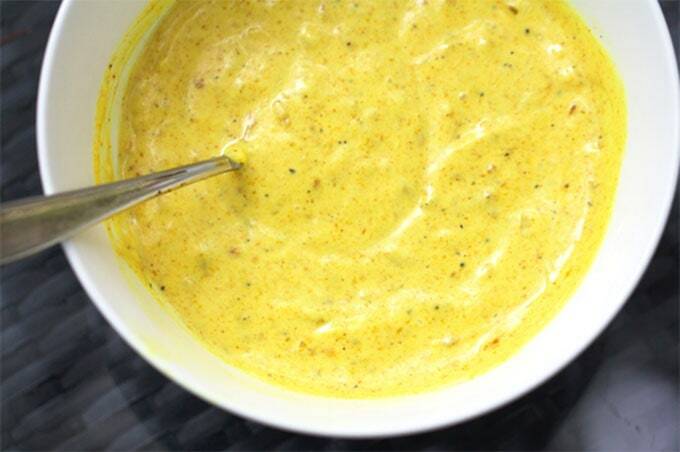 Madras Curry Powder is my favorite store-bought curry blend – it’s rich, spicy and flavorful. If you want to make this dish with fresh homemade curry powder, check out Madhur Jaffrey’s curry powder recipe. Or, as they did for the Queen, on an oblong plate, accompanied by a salad of rice, peas, diced raw cucumber and finely chopped mixed herbs, with French dressing. Here’s How To Make Perfect Poached Chicken for Chicken Salad. More ways to stay in touch: follow Panning The Globe on Facebook, Follow me on Pinterest, Sign up for Panning The Globe’s free newsletter to get the newest recipes and menu suggestions delivered to your inbox. Here’s the Curried Chicken Salad Recipe. If you make this, I hope you’ll come back to leave a comment and a rating and let me know what you think! Cold poached chicken in a tangy curried mayonnaise with lime juice and mango chutney. Poach the chicken Place breasts in a large deep pot. Add cold water to 1 inch above the chicken. Add onion, pepper corns, cloves and bay leaf. Bring to a boil. Quickly lower to an extremely low simmer – no bubbling at all – and cook, uncovered, for 10-14 minutes. Check for doneness after ten minutes by slicing into the thickest piece to make sure there’s no pink color. 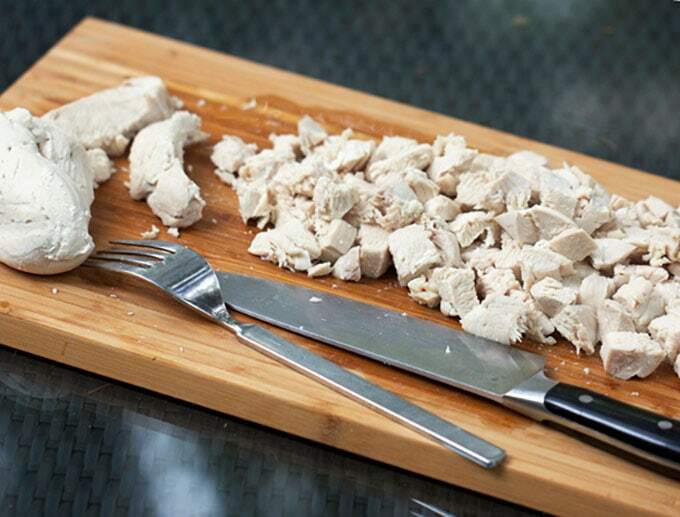 Transfer chicken to a cutting board and cut into bite-size cubes or shred. Cool chicken in the fridge, covered, until you’re ready to use it. Curried Mayonnaise While the chicken is poaching, heat oil in a small skillet over medium-low heat. Add onion and sauté 4-5 minutes, stirring occasionally, until soft (don’t let it brown) Add curry powder to the skillet and cook, stirring, for 1 minute, until fragrant. Remove from heat and allow to cool. 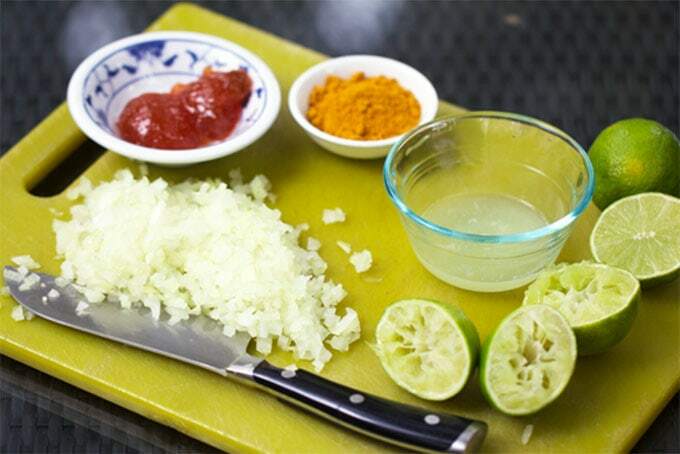 When curry and onions are cooled, mix with mayonnaise, chutney (or preserves), lime juice and salt in a small bowl. (can be stored, covered, in the fridge for up to 3 days. So unbelievably delicious!!!! I love this as a wrap. A great go to to bring to work! This recipe is perfect! Cooking the spices really makes a difference! This was absolutely amazing on a croissant with a little leaf lettuce. I’m so glad you enjoyed the chicken salad and I love your additions to this recipe Sara! Dried cranberries with orange sounds so yummy with curry, and perfect for the season. I’m going to have to try that next time. Thank you so much for your comment. I have made this recipe and it is absolutely incredible! May I suggest that you try the recipe as written and poach the chicken because it truly makes a world of difference! The first time I made it I used a rotisserie chicken and it was still quite good, but once I poached the chicken, I will never make it any other way. I have however used fat free yogurt and Greek yogurt in place of the mayo and the taste is still amazing just less fat grams. Truly a fantastic dish! Love this recipe. My kids frequently ask me to make it. I add sliced red grapes and toasted walnuts or pecans for a little crunch. Thanks Lisa! Nearly ready…… Did you use hot madras curry powder or mild – shop had both which sent me into indecision overload!! Hi Diane, I use mild but I bet hot would be delicious too! Thanks Lisa, I’m off and running!!! Great recipe! One of the best I’ve found for curried chicken salad. I actually marinate and grill, or fry, the chicken beforehand with garlic and herb seasonings. It gives it a nice taste and crispness. I’ve used jalapeño apricot jam in the past. It’s a nice twist, depending on how much spice you like! I’ll also throw some dried cranberries and cilantro in it to give it a tasty kick. I’m so glad you enjoyed the recipe and I love all of your additions – especially the spicy jam! I love curried chicken salad and enjoyed reading the history behind it. Your presentation is gorgeous! 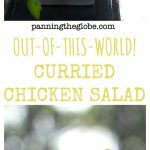 I love curried chicken salad…I almost always make it that way rather than regular chicken salad! The history behind it is fascinating! Can’t wait to try this for dinner this week! I’ve had this prepared by an English chef before and it was amazing, looking forward to making it myself! Thanks for the recipe! Indian food. Probably the best thing to come out of England. I used this recipe to make a curry chicken salad for a Harry Potter baby shower with British fare. It was a hit! I had about half the guests ask for the recipe. This recipe is a real keeper. Thanks for posting! This looks great! My mother makes a similar recipe served over rice and it has chopped celery and green apple. It adds a whole other dimension! That’s an interesting take on curried chicken salad. I bet it’s delicious! I lived in Belgium for a year, where super delicious chicken curry salad (“kip curry”) sandwiches are EVERYWHERE. Since returning to the US, I have found specialty delis that serve chicken curry salad, but it’s usually loaded with raisins, celery, and it just doesn’t quite taste the same. In fact, when I made this recipe, I skipped the preserves because I wanted it keep it more savory than sweet. And guess what – it was DELICIOUS!! Looked the same, tasted the same as the kip curry in Belgium that I SO miss! I know…I had Kip Curry for years, born there and lived there till I married! Always make mine from scratch and it tastes amazing. So easy to do! I never ever add sweet things to mine, I do use some lemon juice to freshen it up and that’s it. 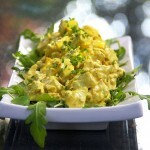 I love this Coronation Chicken Salad! I also heard the story behind the recipe for the first time recently, this Summer at a friend’s house, but her recipe included bananas and raisins as well which was surprisingly DELICIOUS – not sure if that was part of the Queens curried chicken salad though hehe.